OK, since we're (most of us) all quilters and sewists, how many of you think you should have a Spool Quilt somewhere in your life? I've wanted to make one for a very long time, and the Spool is perfect for a stash project. 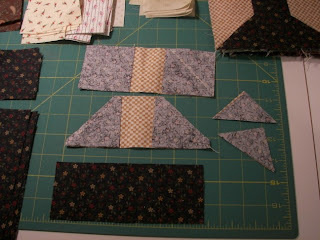 Also, this block is about as easy as it gets, especially if you already have strips cut. My pattern is the same as many others. I wrote up my own directions, but really, it's pretty hard to NOT appear 'lifted' from another source. Mine is NOT -- it's just a VERY easy and effective block. Try it! If you have 2 ½ in. strips already cut, you are already well along in the process, which is EASY. 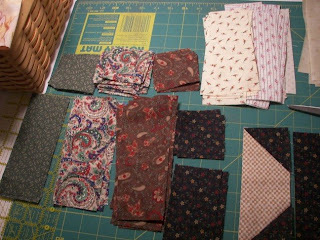 Then, it will take about 4 minutes to sew and press each individual 6 ½ in. block. That’s less time than a TV commercial! Make these 6 ½ inch. blocks in groups of 4 for a 12 ½ in. larger block (like first photo), or set them individually. Set then straight, or diagonally. For One 6 ½ in. (Raw) block, you must have at least, the following amount of fabric. Method: With the 4 dark pieces, place at each end of the light background piece. 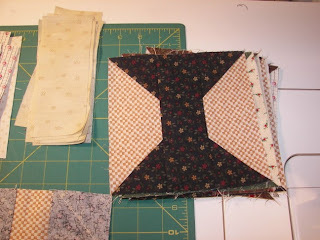 Sew diagonally from corner to corner, as shown below - I call this a Quick Corner. Sew just a hairline to the outside of that diagonal line. Trim the outer fabric and discard. (This time, I am NOT saving the discard for very small HSTs, but if that’s your thing, have fun. They would make a great border!) Press seam to triangle. Both the background pieces with the Quick Corners are the same. Sew background piece to center dark spool on each side. Press seam to the dark spindle . You’re done with that block. 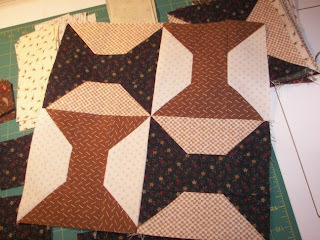 That is such a fun block and it would make a fantastic scrappy quilt. Maybe someday. Wow, impressed with your productivity. Looking forward to seeing how this comes together. You always have such a good sense of color and design, i'm sure it will be wonderful. You're right, a spool is probably de rigeur. Think i will put this project on my list. Well two spools down and I have broken into my first jelly roll. Folkloric. Probably not the best for contrasts. But I did have the bright idea, well I thought is a little bit bright, to use my sewing themed fabrics around the spools and plain colors in the spools. Great way to do spools - I was still doing those pesky inset corners. (Duh.) Thanks for a good tip. I love this. I've always admired the block -- but steered away from inset seams. I guess you posting brought the 'light bulb'. I hope you don't mind-- I printed out you instructions for safe keeping and a 'One day' wish. I'm just starting a spool quilt, bout the same colors. I have the pieces all cut out. I'm piecing mine like a 9 patch with HST on the 4 corners. I'll have to watch and see how yours turns out. Great directions and I have TONS of 2 1/2 inch strips cut. I may have to try this one in a year or so, when I finally work through my list of quilts to make!!! There is a spool quilt under my sewing table waiting to be finished. It has been there for several years. I was thinking of putting a smaller spool design as the border. Your technique is just the thing to help me finish my spools quilt. My spool blocks were blocks that I won at our guild's block of the month drawing. Thanks for sharing your technique. I love spools quilts and have one on my list to make for myself one of these days. I've debated whether to use this method which creates the waste triangle or just use half square triangles. 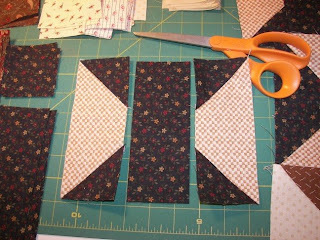 This is quicker for sure but I've always hated the idea of sewing those squares and then trimming off the corners. Thank you for the wonderful tutorial, I sure will try this one day. Maybe I have to order the border book as well. Love your blog! Am I made of money? Have you ever seen a quilt hoop like this? Why I cut strips at 1.91 inches for that border. Lesson for Today - Thanks, Mary Ellen!